For alumni Amanda Begin her Castleton experience opened her eyes to all that can be achieved through hard work and dedication. A History major, Begin was able to incorporate her passion for history and strength of writing to create a complimentary major and miner combination. 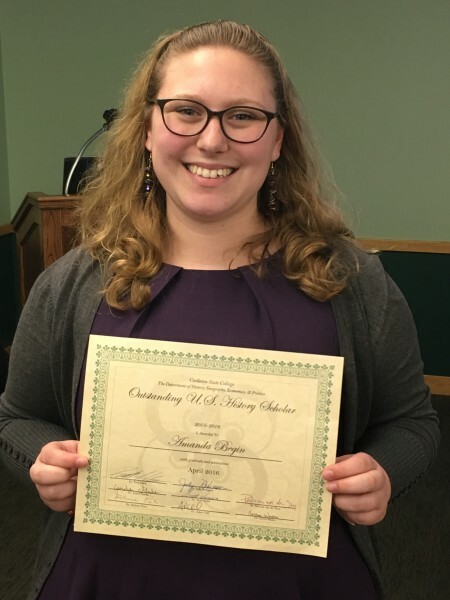 “From my classes I have gained a lot of writing and research experience, which has influenced my decision to get my masters in Library and Information Science,” Begin said. While at Castleton, Begin worked as an intern for the Slate Valley Museum and was involved with the Habitat for Humanity club on campus. Later deciding to focus specifically on her academics, she was able to prosper along her educational journey. Upon graduation and after the completion of her post-graduate education, she hopes to work in a school, public library, or museum. For now, her main priorities include gaining valuable field experience and classroom hours to make herself more marketable before entering the competitive job market. “I will remember the helpful professors and great classes the most but I will also remember the great friends I made and my experiences building houses with Habitat,” said Begin.